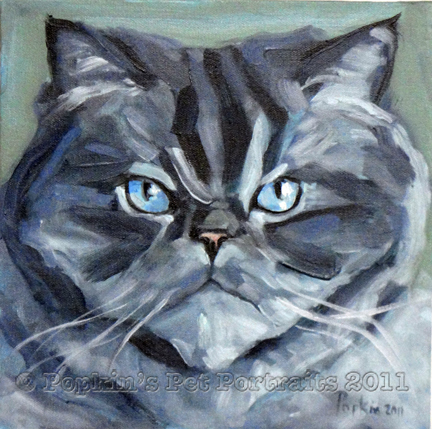 Popkin's Pet Portraits: Flipping Out! I had a little vacation recently at The Glickman-Popkin Bassoon Camp at the gorgeous Wildacres Retreat in the mountains of North Carolina. Which gave me time to catch up on portrait orders. I loved painting all day, uninterrupted! After I finished all that I wanted to keep going, so I did some just for fun. My wife is a big fan of Flipping Out! on Bravo, she loves that Jeff Lewis. I personally have an affinity for Deb- she gets things done! So I painted his cat Monkey. He's got great cranky eyes & looong whiskers. She got so excited, she wrote him and offered to send him the painting. His boyfriend/assistant Gage wrote back that same day & the painting is off to LA!